A gift of fiery flowers for guest artist Christine Piatek! While I work to whittle a lengthy draft down to a brief blog-appropriate post, I would like to share the inspirational musings of friend Christine Piatek, an intelligent and creative woman, and fellow choral-singing enthusiast. Creative inspiration can be found in quiet and solitude, but I also need to interact with creative community from which I draw inspiration and find a home. I need both–to balance the necessary introspection with recess and lunch with the other creative kids. Thanks for letting me share this, Chris! 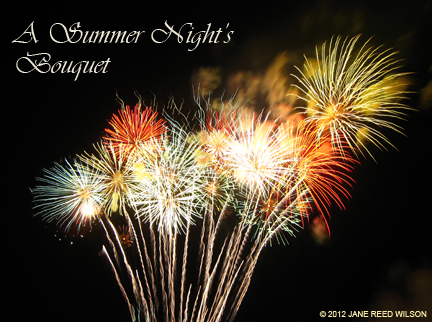 Enjoy the bouquet! Ladies and Gentlemen, I give you Christine Piatek! Attend to it, nurture it. Observation, the splendor of a quotidian day. Ansel Adams said the following: Millions of men have lived to fight, build palaces and boundaries, shape destinies and societies; but the compelling force of all times has been the force of originality and creation profoundly affecting the roots of human spirit. We humans are at our best when inventing, creating. Indeed, our lives depend on its practice. A song takes shape, if you listen. Our creativity warms and even heals our broken hearts. You must give birth to your images. They are the future waiting to be born. Fear not the strangeness you feel. The future enters you long before it happens. Just wait for the birth, for the hour of clarity. Creativity doesn’t need fancy new tools, although my stash of art supplies and computer software would make it seem I think otherwise. Certainly walking through the doors of the art supply store known as Pearl is to enter the cathedral of my craft, processing past row upon row of inspiration, breathing in the heady incense of paint, pencil, paper and possibility. OK, alliteration alert! Sorry, I’m intoxicated with the fumes of my brain firing all creative cylinders. I have a few creative projects in the works. Yes, people actually pay me to procrastinate, er, I mean to do creative projects for them. Sometimes I do this for FREE, but don’t let that get around. On tap right now: a book cover, trade show booth design, a branding project (don’t worry, no cows hurt in the process), and a save-the-date postcard. If I forgot your project, don’t worry, I’m getting to it. Never mind my own creative projects. Where to start first? Drawing, photography, watercolor, scrapbooking, card making, writing? Oh, right, I’ve got other stuff to work on first. Yes, we of the creative stripe just don’t know when to say no, so we’re always overdone. But driven to create. Creativity begats creativity. Finding it hard to get at those big projects? Maybe it’s time to let your mind play with a project that has less at stake. Prime the pump if you will and creativity may start to flow. My father always said you should start the day with a good breakfast that includes a good dose of protein. He was a doctor and a shrewd fellow. My husband and I went out for breakfast yesterday and before he could get at his bacon and eggs, I couldn’t resist the urge to play with his food. 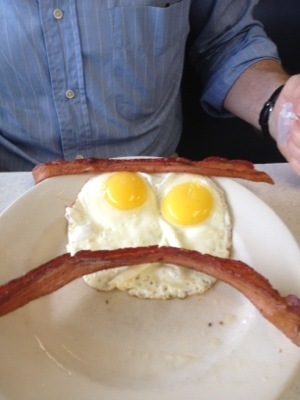 I couldn’t help myself, the plate of sunny-side-up was staring at me with two jaundiced eyes begging me to reposition the bacon into a unibrow and a handlebar mustache, the results of which I had to record for posterity (see photo). And perhaps once I had this chance to play, I was an ooch more productive that day. Get it out of your system. Have some creative fun and you may feel less pinned down by your professional commitments. Don’t worry, be happy. Play with your food. Doctor’s orders. One of my earliest creative memories is of trying to amuse myself with the tools at hand while attending a day camp in a wooded area near my home. I was ferried off to this camp on a regular basis one summer to the point where I think it felt like my first job. Most likely it was only a week or two, but I took my appearance there every day very seriously. I even got up one rainy Saturday and wandered sleepily downstairs in my jeans and t-shirt and rainboots, ready for a day of damp outdoor activities, to find my parents and brother eating breakfast in the kitchen and telling me I had the day wrong and I didn’t have to go. A little creek wandered through the trees and the prickly bushes and the tall grass at the camp. Who wouldn’t have been drawn to the water to splash and play and watch rivulets form between the mud on the bank and the shallows? I discovered I could mold things with the dirt, in much the same way I could with the sticks of clay at school (still love that red clay smell). 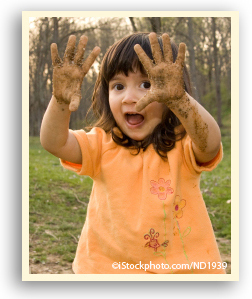 I happily settled in to create something with my bare hands by mixing the rich Kansas soil with some murky water. “What are you making?” “I’m making a Jayhawk!” The Jayhawk, a fictitious red and blue bird with a yellow beak, is the mascot of the University of Kansas. If you were born in Lawrence, Kansas, as I was, Jayhawks were a part of your life from day one. I knew from memory what one looked like. My Jayhawk rose from the ground a solid dark brown mass with a somewhat unsettled proboscis. I never got to finish my woodland golem. “Sunny!”, I heard someone cry. (Yes, my nickname at camp was “Sunny”. ) “You have to come see this!” I reluctantly left my growing lump of wet mud and ran off to see what on earth could be more important than my project at hand. “It’s a cow killer, a cow killer!” Apparently this is a type of insect which I had not heard of before and haven’t since, for that matter. Much high-pitched screaming by five-year-old girls ensued and after much running around to escape the dreaded scourge of bovine mammals, it was time to go home. I couldn’t wait to get to camp the next day to finish my creation. It had rained that night, and when I rushed to the creek, all signs of my muddy sculpture had been washed away. I suppose if this was today and I rushed away from the computer to save my husband from a large insect, I would have hit “save” first and happily returned to Adobe Illustrator after throwing pillows at whatever was attacking Joseph. My childhood attempt at sculpture may have been my first lesson in the impermanence of art installations (you can’t hit “save” in the woods), and also in the ability of creating art to keep one focused on one thing for a period of time. It was sheer delight creating something out of nothing and if I ever go somewhere without my sketchbook or my camera, I know I can still have fun making art with the help of Mother Nature’s Art Supply Emporium. So, it all started because I wanted to reply to my sister-in-law’s post, and after much aggravation found myself getting a sign-in name to WordPress. Then I wanted to post to a garden blog, and found I couldn’t use that sign-in to leave a post. Then I am asked if I would like to create a blog, so I say “why not” and here I am. And shouldn’t a blog be a subject near to your heart? Which design or “love of the visual” is, whether I can control it or not. And now I am late for an appointment, which might give you a clue that my left-brained tendencies are possibly combined with undiagnosed ADD. Guess that just makes me the spontaneous, distractable, cluttered, chasing-after-butterflies being that I am. Welcome to my world, and who knows what will come of this.